Following the success of the first edition, launched in 2015/2016 in over 34 African countries, Total is once again holding the Startupper of the Year Challenge in 2018, this time on a global scale in almost 61 countries and on every continent. Total believes there is a huge untapped potential on all young Ethiopians and Total stratupper challenge is a great opportunity to harness and develop these potentials. 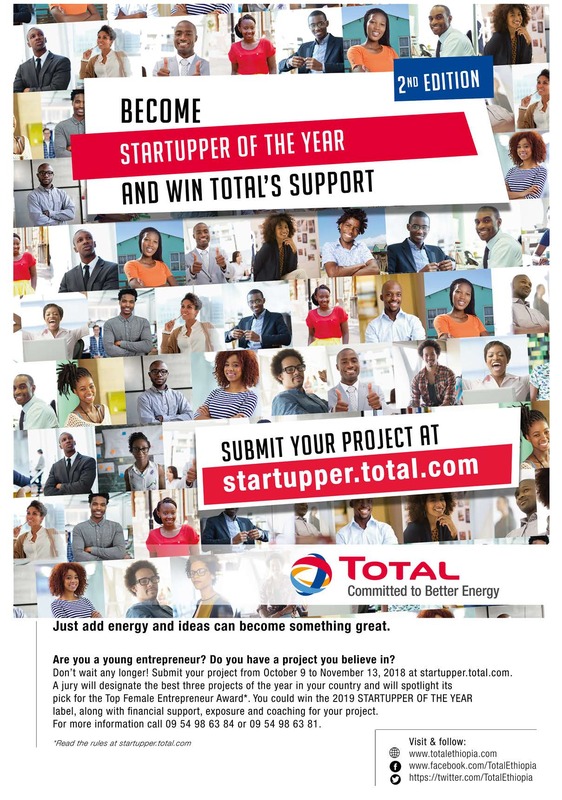 The Startupper of the Year by Total Challenge 2018-2019 is designed to support and reward young entrepreneurs up to 35 years of age who have a project or have created a company in the past two years, regardless of their business sector. Please visit this dedicated webs sites.